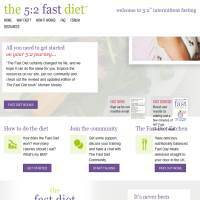 TheFastDiet.co.uk is a UK-based service, offering online support and home deliveries. It encourages the use of the 5:2 diet, a fasting system whereby you eat normal healthy meals for 5 days of the week, and then switch to low calorie foods for the remaining 2 days. The rationale behind this diet is simple: it’s easy to maintain. You can still eat on fasting days, but a reduced calorie diet is required. Apart from that, your other days allow you to continue to eat your favourite foods (within reason!). On your fasting days you can eat up to 500 calories (for women, or 600 for men), and the site delivered foods to help you on those days. We were pleased to see that the service isn’t hugely expensive. Your fasting foods are delivered to your home, free of charge. Then, when your fasting days come along, you simply pick one of the meals and you’re set. These meals are provided by the The Fast Diet Kitchen, and include dishes such as hearty bean soups, chicken casseroles, chilli and meatballs. If you want to save money you don’t need to order food from The Fast Diet, you can simply make it yourself. The site offers cookbooks or you can chat to other members online, sharing tips and recipe ideas with each other. There are also other websites you could visit, or you could just create your own low calorie meals for your fasting days. TheFastDiet.co.uk provides apps for tracking exercise and diet, plus a BMI calculator. These are all simple tools, but it’s good to have them available to you. We’d appreciate it if the site provided more recipes and nutritional calculators, but since they’re trying to sell their own meals we can understand why this wouldn’t be a priority for them. The range of meals is a little limited, with half of the options being soups. Still, you can’t expect too much from 500 calories in a day, particularly as many of the meals are under 500 calories so you can still snack on vegetables or other healthy snacks through the day. This is a simple website with a few useful tools. Whilst they could offer more recipes and advice for free, the meals on offer are relatively cheap and delivered for free. This prevents any minor mishaps in your cooking (such as forgetting to add the calories for oils, butters, seasonings and so on) and takes the hassle out of the fasting days.